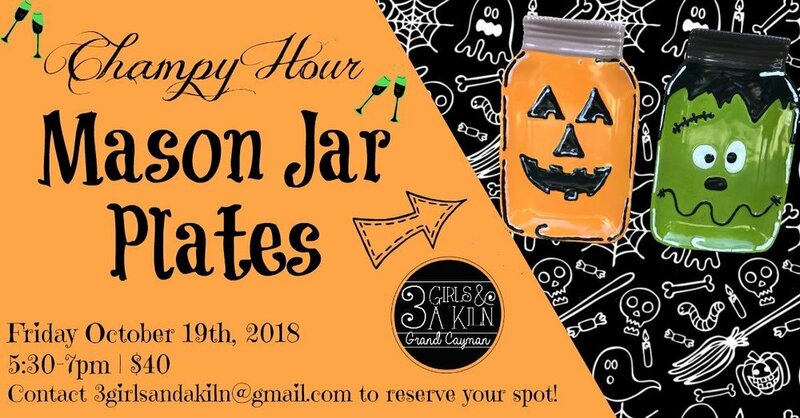 Friday | Oct 19 | 5:30 - 7 | Spooky Mason Jar Dish Glazing Class with Aimee | Champy Hour! What's the dish you ask? Find out at 3 Girls and a Kiln when you join Aimee for her spooky mason jar Champy Hour! Pumpkins, Frankensteins and Ghosts are all great options for decorating your mason jar perfect for the Halloween season! This is a decorating class is for one (1) s. All materials and firing costs are included. Champy Hours are all CI$40 and registration is required.